I attended Ball State University where I was the Executive Producer of my own late night comedy talk show for my last two years of attendance. For a show that had zero hands-on faculty supervising, I was the one who kept the show together and made sure we went on air every week. I graduated from Ball State University in 2013 with a degree in Telecommunications. After graduating, I found myself freelancing in Chicago until an opportunity for a steady job at FOX 59 in Indianapolis arose. I worked my way up from a part-time Production Assistant to full-time and eventually becoming the Video Editor for the morning news. 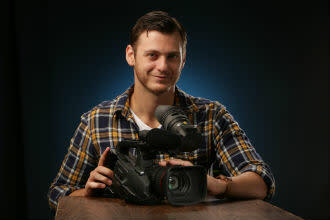 I left the stress of early-morning shifts and live TV to work for a smaller video production company called Image Resources Inc. as their Videographer/Video Editor. Although I wasn&apos;t planning to leave the company right away, I quickly found a new home at the South Shore CVA. I finally found a place that can give me an outlet to be creative and have some fun in my field. At the South Shore CVA I help promote northwest Indiana through video; highlighting the great things to see and do in the region. I also handle the organization&apos;s IT and AV needs for a number of special events at the Indiana Welcome Center.